In 1969, Rolex simultaneously launched references 6263 and 6265, replacing the first Oyster Cosmograph - Model 6240. 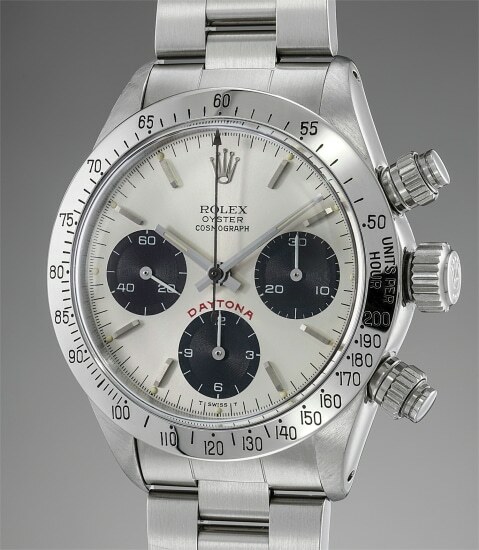 The Cosmograph Daytona with screw-down pushers was in production for almost 20 years and was offered in either stainless steel or gold. The present example is categorized amongst collectors as the ‘Big Red’, distinguished by its large red ‘DAYTONA’ signature above the 6 o’clock register. This watch is fitted on a stainless steel Rolex Oyster bracelet, enhancing the sporty aesthetic it is famous for. The silvered dial is in excellent condition, with fully luminous hour markers along the outer ring, all of which are present and intact. Additionally, the flawless solid-finished dial glistens brilliantly against its contrasting black subsidiary dials. The present reference 6265 from 1978 is presented at auction as a full set; the watch is accompanied by its original box with outer packaging, the original punched guarantee and even the original Rolex hang tag bearing the detail of the watch. This versatile watch can easily be worn during the day at the office, on a weekend getaway at the beach, or even for black tie events.